“This group was created out of a need and a desire for a space for spoken word to exist, and for collaboration,” said Bryan Erickson '15 of Speak Out Loud, a campus spoken word organization. Though it looked like a science fair on the outside, what with all the poster boards on display, Wednesday’s Literary Homecoming was a success, drawing delegates from the campus’s literary scene and students looking to find their lit niches, and get a foot in the door, too. Sponsored by the Woodberry Poetry Room, the Literary Homecoming gathered inside the Barker Center representatives from the English Department, the Harvard Review, the Harvard Advocate, Speak Out Loud, and Tuesday magazine, among others. 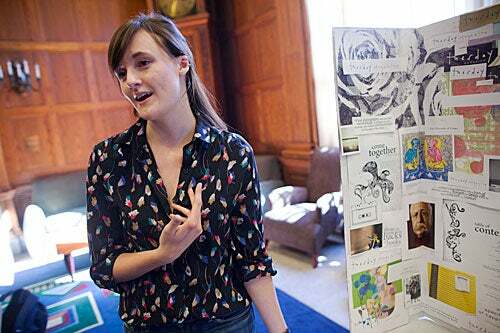 English concentrator Amy Robinson ’15 was stationed at a table for Tuesday magazine. Robinson, who writes fiction and nonfiction, learned of the publication at last fall’s activities fair, and now she’s co-president. “Tuesday is such a great magazine, and it’s new and it’s small, so anyone getting involved can have a big influence,” she said. “Tuesday is such a great magazine, and it’s new and it’s small, so anyone getting involved can have a big influence,” said Amy Robinson ’15. Nearby, Bryan Erickson ’15 and Cassandra Euphrat Weston ’14 manned a spot for Speak Out Loud, Harvard’s spoken word poetry organization. “This group was created out of a need and a desire for a space for spoken word to exist, and for collaboration,” said Erickson. The group sponsors open mic nights in Ticknor Lounge and hosts workshops. “We’re not just creating a community of poetry, but poetry that’s often very personal. That kind of vulnerability is important on an analytical campus,” said Euphrat Weston. 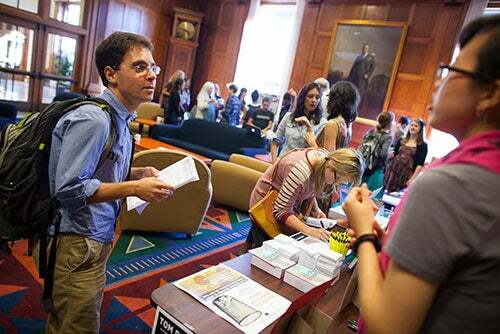 Crouched in a corner, Harvard Law School student Joel Knopf picked through stacks of free literary magazines. Knopf said he is at work on the second draft of a young adult novel and came to the event to find opportunities to work creatively at Harvard. Harvard Law School student Joel Knopf stops by the Harvard Review table. Arts @ 29 Garden program manager Bess Paupeck spun records on a turntable. The records were pressed with mash-ups of student responses to Woodberry Poetry Room recordings, and were made during a Winter Session creative writing workshop. “This January, we’re doing an arts journalism and criticism workshop with the Nieman Fellows,” Paupeck said. In offering a preview of her book, “Book of Ages: The Life and Opinions of Benjamin Franklin’s Sister," Harvard Professor Jill Lepore noted that Franklin's sister was “the anchor of the family history” and supplied her brother with important details.